I know that some of you live in the warmer areas of the globe. While others just love basking in the sun like it’s always summer. Wherever you are on this planet, or whatever season is your favorite, you might want to keep your face feeling cool with this DIY refreshing face masks. What I love about this is that it’s not just refreshing, but it can also remedy a number of your skin concerns. According to traditional Chinese medicine, you have to embrace the mix of warm and cool weather. If you simply want a vacation or you feel like you need a spa day at home, this DIY face masks will surely bring you a cool, calming energy to the skin. If you just came home from a sunny vacation and you have mild sunburns, the recipe below can also be used as a weekly hydration treatment. But the thing is, I just simply love cooling masks like this all year round! It doesn’t matter if it’s warm or not, use it anytime you feel like you need it. Aloe vera is good for the skin. It contains two hormones called Auxin and Gibberellins. Those two hormones provide wound healing and anti-inflammatory properties that reduce puffiness and skin inflammation. 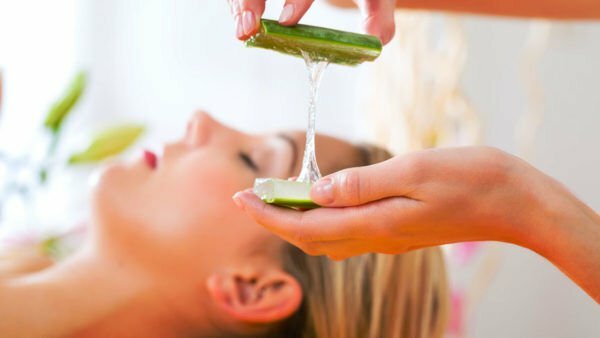 Also, aloe is considered effective in healing chronic skin problems such as psoriasis, eczema, dandruff, and acne. The Egyptians even call aloe vera the “plant of immortality”. It is also very effective in soothing sunburns, itchy and dry skin by its powerful healing activity at the epithelial level of the skin. It can act as a protective layer and helps replenish the moisture. It is also a powerful source of antioxidants which helps the skin heal quicker. Bruise and mash up the mint with a mortar and pestle to release the essential oils. Apply it all to your face. Leave the mask on for 10 to 20 minutes. Mix all ingredients in a small bowl to form a well-combined gel. Apply the gel onto your whole face, avoiding the eye area. Leave it on for 10-15 minutes, then rinse off with warm water first, then cold water. Tone with cooled green tea. Moisturize with 3 drops of argan oil! Extract cucumber juice by blending a cucumber with a little water. Next strain the cucumber puree to obtain cucumber juice. Pour 2 teaspoons of it into a small bowl. Next add 1 tsp colloidal oatmeal, 1 tsp pure aloe vera gel, and ½ tsp honey. Mix well. Apply it on your face and let it sit for 10 minutes to soothe and cool skin. Rinse off with tepid water when the time is up. Spray rose water on your face to tone, then moisturize as usual. Into a small bowl, dump in 2 tsp aloe vera gel, 1 tsp rose water and 1 tsp sandalwood powder. Mix everything well to form a smooth paste. Slather the mixture on your whole face, avoiding the eye area. Leave it on for about 10 minutes to sink into your skin cells then rinse off with tepid water. Splash your face with cool water and lightly pat it dry so it’s still damp. Onto your damp skin, apply a pea-sized amount of shea butter. This will seal moisture into your skin cells, leaving your face hydrated and supple! Twist open an activated charcoal capsule and dump its contents into a small bowl. Next add 2 tsp of pure aloe vera gel. Mix everything up till your form a black gel. Apply the gel onto your skin, avoiding the eye and mouth area. Let it sit on your face for 7 minutes for the detoxifying effects to work their magic. Rinse off with cold water thoroughly and pat your face dry with a clean towel. Moisturize your skin as usual. To be natural, moisturize it with a pea-sized amount of shea butter or 3 drops of a natural skin care oil like argan oil or jojoba oil. I love aloe vera as an ingredient. It’s really soothing and it makes my dry skin feel really nice. I’m going to do these masks every week. Especially the detoxifying one. ? I have dry and flaky skin. The only thing that saved my skin from getting worse is aloe. It’s really better to go for something natural. Where can I get an aloe plant? Aloe vera is soooo amazing. I have oily skin and aloe doesn’t make my face more oily. It actually balances my oiliness and makes my skin look healthy. Isn’t aloe vera amazing? It has so many uses too! If you haven’t slept properly for the past few days, aloe vera works well with puffy eye bags. I highly suggest that you guys use real aloe gel rather than store brought aloe gels. Most of the store brought ones have high alcohol content and it could make dry and sensitive skinned people look and feel worse. Oh, I agree. I’ve seen tubs of those and it does have high alcohol content. It can be drying and irritating. I need some hydration in my face. I also heard that you can use aloe pretty much anywhere, your hair or your entire body including your nails.? That’s right, Miriam! Anywhere you want to be moisturized, aloe vera can do it for you. It also works on different skin types. Try it! Heard a lot of good things about activated charcoal. If you mix it with aloe vera, I’m sure it can really purify your skin. I have to try this! When I’m breaking out, aloe is the only skin care gel that my skin tolerates. I also find that it reduces the redness on my face. I have sensitive skin and I’m prone to redness. I always make sure that I have aloe vera at home because of that. It really is soothing. I also find that it calms breakouts. Yes, aloe is very good for acne. I remember when I was younger, I always had a lot of acne on my cheeks. My mom would always use aloe vera to get rid of the redness. The next day, my pimples are almost dry. Even until now, I still love aloe vera and I always make sure that I always make sure to have potted aloe vera at home. Isn’t it such a magical plant? I love aloe vera so much! I’m glad to know that it worked well for you. I love using aloe as a base for a lot of face masks. Even mashed cucumber or bananas also feel nice with it.? Wow, if only I could find fresh aloe vera gels or a plant. I would do this weekly. Activated charcoal has been a hit for deep cleansing. Does it really work? I love the cooling feeling aloe vera gives. I love it especially on hot days and when I feel tired. Me too, it gets rid of my terrible eye bags too! I don’t have these essential oils. I hope the effect is still similar if I just omit it from the recipe. Ooh i love diy hydrating masks!!! Usually I use equal parts of honey, glycerin and rice flour. If i have any at hand: Teaspoon aloe from the plant Teaspoon turmeric root (less staining( no dyes)) 2-3 drops tea tree oil if i have a breakout. I’ve been using Aveeno Soothing Bath Treatment, which is just colloidal oatmeal that I mix with water, as a mask. I love it. Simple and makes my skin baby soft. Edit: Oh, I just realized I don’t think that counts as a DIY mask. But it would be the same thing as blending oatmeal into a fine powder and mixing that with water. I like mixing colloidal oatmeal with honey and water to use as a mask. Super gentle and makes my skin soft. I actually love making myself a mask out of aloe vera and, if I feel fancy, honey. It makes my face less red. Honey mixed with aleo vera and green tea leaves is my go-to. Hydrating, calming, and a little exfoliating (if you gently rub the tea leaves in). Skin always feels super smooth afterward. A side comment but has anyone noticed while using the aloe gel, that their face becomes dry?? or drier than usual? I find that I have to mix the aloe gel with something more watery (a serum, essence or lotion like Gokujun) otherwise my face is just oddly dry. I do follow up with a moisturizer and then a sleeping pack. Can aloe have that effect or is it just my cold, rainy climate, messing things up? Aloe is a humectant; because it draws in moisture from around it, if you just use it alone, it’ll take the moisture from your skin, which obviously will be very drying. It’s always best to mix or layer it with something else moisturising! It’s so silly how excited I am by how refreshing the gel is. I love it! I’ve not been able to determine exactly why I like putting it on my face, but I do. The texture, smell, after feeling… I really enjoy using it ever free nights after my moisturizer, before sleeping pack. What purpose does it serve though? Anyone know? I’m unsure. I’m looking to add an aloe gel to my AB routine too and have a few questions! *At which stage of the routine is it best applied? *Also, is it better suited for morning or night routines? LET ME ADD SOMETHING!!! Also when you cut the aloe vera plant make sure to cut from the very bottom. If you cut if from the middle the whole stem dies like it dries out﻿. Thanks for the tip, Beatrice! Ahhhh this stuff is GOLD!!! I love it. I take the gel/juice and put it in a spritz bottle (3oz)add a few drops of coconut oil or almond oil and you can use it for almost everything, hair moisturizer , any thinning or bald spot,lice, dandruff, dry scalp, skin for scrapes, cuts, burns, scars,pimples , skin moisturizer, eczema, psoriasis mosquito bites, rashes………… heck even drink it but the yellow goo NO!!! I learned the hard way ?? ?Love ur beauty tips ? I don’t use anything on my face but my skin is glowing because i drink 3 letters water par day. But im going to try this starting from today and i’ll keep u updated if it works after a week﻿. 2) I had got acne last few months now they have disappeared almost 70% gone. Acne marks (black) have become faint. I love aloe vera! Is it safe to use the ones that grow in your garden (those small ones)? I heard that those ones aren’t safe to consume.. Not sure if it’s true at all. I am not sure about poisonous aloe plants – but i do know that consuming the whole leaf instead of just the gel can sometimes irritate peoples digestive system and causes a laxative effect. The worst thing i think is people confusing aloe for other succulents because they can look kind of similar. Hey! Botanic student here. There are only 5 varieties of aloe that can be taken inside. While there are over 200 species. Also extremely important not to use anything but the gel – because it has aloin. Do the aloe in your yard have white spots? The ones that are just plane green leaves are aloe. However, before eating it you might want to look it up online or ask someone. Definitely wanna go buy the plant now. I had no idea they were so useful. Thanks for the great tips! I have an aloe vera plant in my back yard. One time I used it on a scrape on my face and it turned yellow. Also smelled so bad that I couldn’t stand it and had to wash it off. Is this normal? The terrible smell is normal. I was so surprised at first when that happened. Just let it sit out a while and wash it off with water. Then you can extract the actual ‘gel’ within the (leaf)? Another aleo tip – If you apply aloe vera to your scalp and leave it on for like an hour then wash out it makes your hair really soft and helps with hair growth! The face mask works great for my acne prone skin I just put toothpaste on my pimples then over that I put aloe vera and go to bed like that then when I wake up my acne is not completely gone but much much healthier! love this! at this farmers market near me they sell huge aloe vera leaves for 1 dollar! I don’t know where to get shea butter for the face though. I have lotion that has shea butter but I know that can’t be used in the face. Is there pure shea butter? 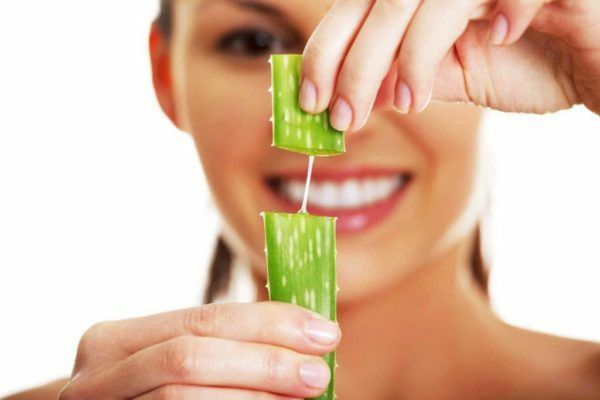 Aloe makes cells work faster, that’s why it helps to heal skin after burns, to get rid of pimples and stuff. If you have many active cancer cells in your body, then eating or drinking aloe can help those bad cells grow faster too. I have Aloe Vera gel in a bottle from the store. Like fruit of the earth brand I think it is. Will that do the same thing or do I need straight up Aloe Vera? After you did the mask did you put any moisturizer on? And did you always rinse it off or would you leave it on as a moisturizer? I have designated spa days at home. I find it cheaper at more effective because I know what I’ve been putting on my face. I agree. I have sensitive skin and I have yet to figure out which ingredients make me breakout. Curating my own skin care from natural ingredients is better. Aloe vera gel can also be used on your hair. I just massage it to the roots of my scalp and it gives it a nice sheen and feels soft afterward. I’m constantly under the sun because of my field of work, aside from sunscreen, my bestfriend is aloe vera. Sometimes, my sunscreen isn’t enough to protect my skin so I get sunburned. Aloe vera instantly makes my skin feel better. These are very easy to do at home. I haven’t really tried using aloe but when I have the time, I’ll get an aloe plant. I only have aloe in my mist sprays but not a real plant. Cucumber + Aloe is such a magical pair. I swear I feel like I’m 10 years younger when I use them together. My grandmother used the Aloe Vera plant for EVERYTHING. Great for scars, burns, skin and MOST DEF HAIR. Its AN AMAZING hair conditioner. I own an aloe vera plant so I just carefully cut a leaf, gently “shave” off the sides with the tiny spines, cut it into small pieces, and delicately rub it onto my skin. If there’s “juice” I just massage it into my skin. I’ve been trying to find the large aloe Vera plant/plant. I found the small one. Where did you purchase your plant? I use aloe vera gel every night and it has given the perfect skin. No need for foundation anymore . You can use aloe Vera as a nail polish I used it as a nail polish and it made my nails long after I used it for about two months . Does aloe vera enhance the growth of hair in face of females? This scares the hell out of me. Please reply. Woah. We have an aloe vera plant in our backyard. It’s been there for years. I’ll immediately cut a leaf and use it fir my skin and hair . At home I saw my mother and grandmother use aloe vera for many things. When I was a teenager I always used a lot of vitamin E (which I used aloe vera as well) and it prevented me from getting acne for many years. Also helps with bruises and inflammation, which aloe vera is a natural anti-inflammatory agent. I always try to have a potted aloe vera at hand for emergencies. this is so true. i second this 👌 i have aloe vera growing in a bunch in my backyard 😳😆 anyways so i do it for like once a week and it does work wonders. I just scored some fresh aloe vera leaves from the local market! But Mine are pink on the onside and some are still clear.. have you had this issue? Since I am allergic to any insect that stings/bites ( hornets, wasps, mosquitoes, ants, etc. ) I have an aloe vera plant to put on the bites/stings to help the swelling. That’s pretty much it, though. I LOVE aloe vera for my face. After using it once i noticed my pores shrank, my face looked brighter, and my skin felt baby soft. I just learned that it works miracles for hair too. Question: is there aloe Vera in a tube or something instead of buying the plant? I didn’t know if there’s something besides the aloe that is bright green and not 100% natural. Thank you so much for the tips! I’ll try them when I’ll get my own aloe vera pot! I love this plant! I usually get really sun burned during the summer because of my fair skin, so we use aloe vera to help the healing process. It’s an awesome plant! We usually don’t get a gel, we have aloe vera plants, we use the leaves. 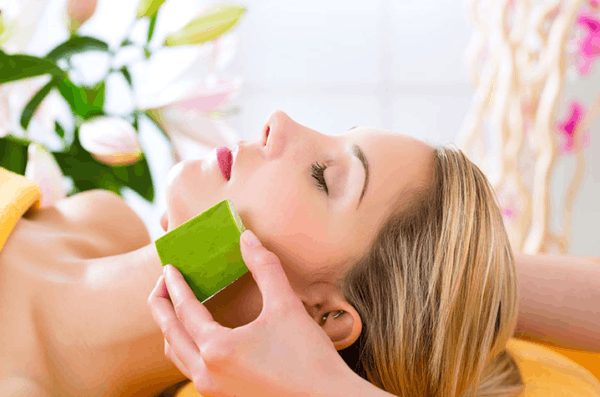 Aloe vera is great to soothe irritated skin – rashes, sun burn…It’s really useful to have a plant around. I loved this!! I really need to invest in an Aloe Vera plant. Can you keep unused cut leaves in the fridge to retain their freshness?? I have a question. There’s an aloe Vera gel at Walmart and I was wondering instead of the DIY could I buy it or is the gel at Walmart filled with chemicals that’s unhealthy for my skin? This was super helpful because I have a huge aloe vera jungle in my back yard and I had no idea what to do with it. I love aloe vera when I used to live in the islands. I used it quite often. For my hair and skin and to drink also… Veryyyy bitter though lol. I need to start using again. do you wash the aloe vera of your face after applying it or do you just let it dry? Because i heard you should wash it off after 5 minutes but i’m not sure . Is there any way to store Aloe Vera? I always end up cutting off too much, or wanting to save pieces for later. Is there a way to do that without letting it get dirty or old? Keep it in freezer. You can put it into air tight container in the fridge. This way you can keep it much longer . This is great! I use aloe Vera for soothing cut and graze pains and I also use it after shaving my legs to help reduce ingrown hairs! Got lucky, I have 6 aloe vera plants growing outside. They are very common here in my area. If the natural aloe vera itches when i put it on my face does that mean its working? I have a chemical burn (thanks face mask 😓) and I’ve been putting aloe Vera on my skin multiple times a day cause it feels good lol. Just wondering how my skin will be if I use it even after the burn heals. My mom has a lot of aloe Vera plants at her house she uses them like crazy and so do I and it helps a lot for many other things too. what’s the best way to harvest the leaves? i have a really BIG plant and I’m wondering if it’s okay to cut tips off the leaves and just keep cutting it back like that, or if I need to cut off the whole leaf…thoughts? I remember seeing a big aloe vera leaf on sale at a supermarket and thought it was funny because I have never seen a grocery store selling one but now I regret not buying it or even remembering which store it was. You have to cut off the whole leaves because it will dry up. Just cut of small leaves . Where do you get the plant, and how long does it take for the leaves to grow back after you’ve cut them? I got mine from Ikea for only a few bucks and it grows quite big , and it heals itself really quick! Make sure you get one of the 4 aloe plants that are safe to use, hundreds aren’t! Aloe barbadensis miller is best. You are honestly one of the most informative and helpful bloggers I am aware of. You’re doing so great! Nope. It won’t work the same because the packaged gel has preservatives . Yeah what part is the yellow goo?? Like the gel part stuff that coats the more solid parts of the pulp & inside of the leaf? Does anyone know where I can buy an aloe? I’ve looked at the home store but they were quite ugly and I don’t trust them. Thank you for being so REAL with your skin. You inspire me to appreciate my skin way more now. Can we use the Aleo Vera gel by itself on the face if we can’t find the other ingredients? Also does it work on dark circles around the eyes? For some reason I have never noticed the smell, but the one thing for me that i don’t like is when i apply it to my face and lick my lips later without noticing and freak out because of the bitter taste haha! Its definitely a great healer. There are different types of aloe plants and some of the leaves have this stinky yellow juice that burns any broken skins, it’s extremely bitter too. Was gonna get this for shaving my face. Should I use while or after shaving or both ? Do both work well. They both work well. It works great as a shaving cream and a moisturizer for after. I have an aloe plant, but I never use it lol. cause it smells bad to me. but my mom used to put the gel on sores and it helped heal it faster. You could freeze the gel in ice cubes for individual uses. I got stung by Stining Nettle and it worked wonders to soothe the itching. Hellooo ! After removing the mask, do you wash your normal face and put on cream? or do you leave it like that? what’s your skin care routine ? also to do you recommend doing this in the morning or at night ? This Aloe does work. It has been my all time acne and scar product healer. I tell everyone to use it. I put it on before bed and sleep with it and just wash it off the next day when I wake up. I put aloe on my face every morning, straight from the plant, but i don’t even wash it off i just go into my skin care after it dries! also works out fine . Aloe is great for hair as well. About a year ago my hair started falling out. No health reasons for it could be found. I’ve tried numerous remedies and nothing was working so I started putting raw aloe (not the gel) on my part, and honestly within about a month I started to have little hairs growing back. I used it every night. My grandma also cured her stomach ulcers by drinking aloe water. Awesome article. I really appreciate people who get straight to the point yet provides a tons of information. This does not work for every skin. I tried this and on the fourth day , my skin was having allergic reactions to this. Would you need to wash the face mask off? And if you do, how long should you leave it on? Cant wait to try this. I used to have my face flawless but suddenly i dont know what happened i started getting red spots in cheeks and open pores. So if this helps i will be so happy. Ha so I’ve been meaning to cultivate the gel for my skin. I have one at home and when i cut it, it smelled gross! I was reading (and my momma also told me) that the yellowish oil that comes out is what smells. I’m gonna try again cuz i really wanna use it on my skin. I got an aloe plant and Im gonna use it just right now . i just washed my face and pat it dry and now im gonna go get that aloe plant and put it on my face over night and wash it in the morning! I have a question when you use aloe after you’re done leaving it in then rinsing it out do you put something else on your face and if so what do you put ? I live in the desert of california, This stuff is unavoidable to see growing in the wild or in a pot, You can’t ingnore them. The yellowish juice that comes out when you’re cutting the aloe is also beneficial. Squeeze the gel out over the blender so you don’t waste as much of the juice and gel. Love this. My grandparents rubbed Aloe on our faces every day before school but we never washed it off. Do you wash your face before or after the mask? Morning or night? And what do you moisturize with? I’m starting mine today . Wow, this brings back childhood memories. My mom used to have us clip aloe for her. Not sure how I didn’t know about this. I have a huge aloe plant that I can just cut a piece off of. Definitely trying this immediately. Thanks girl! This is great for face and skin, but… IF YOU HAVE BLONDE HAIR DO NOT PUT ALOE ON YOUR HAIR IT WILL MAKE YOUR HAIR HAVE A GREEN TINT !!! I add a little water to some bottled aloe vera gel to wash my face. It also helps scars.